Les Eyzies lies at the heart of an unspoiled area of great natural beauty with rolling hills, tranquil rivers, and fascinating cliff and rock formations. It has some of the world's most beautiful caves with outstanding stalagtite and stalagmite crystallizations. 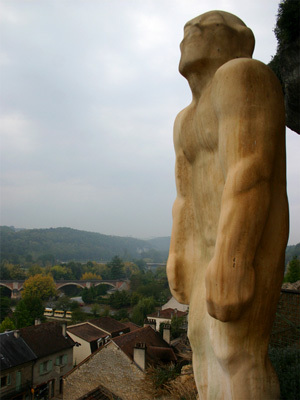 And the cave-lined Vézère valley has been classified as a heritage site by UNESCO. Set in the heart of this well-preserved environment, Les Eyzies instills vistors with a sense of harmony and well-being. A prehistorian once said that there were only 2 prehistoric sites in Les Eyzies, those on the right and those on the left bank of the river! Indeed, man left vestiges of his presence in Les Eyzies as long ago as 35,000 years. So, it is not surprising that the study of prehistory first began and developed here under the auspices of such illustrious names as Perony, Leroi-Gourhan, Capitan and Abbot Breuil, and Abbot Glory. Indeed, it was in this village that Cro-Magnon man was discovered, as well as the cave paintings at Fond de Gaume, one of the last remaining prehistoric cave-painting sites in the world still open to the public. Moreover, Les Eyzies is home to the National Prehistory Museum which houses one of the world's most complete collections of prehistoric artifacts. Life was hard for those who lived in this area of narrow valleys and arid hills. They knew poverty, misfortune, and endless conquest. Successive invasions by the Romans, Barbarian Tribes, and Vikings led to resistance and revolts which earned local people the name 'Croquants' (loosely translated 'rebels'). The region was the through route for pilgrims on their way to Compostello, the battle ground of the Hundred Year War and then the Wars of Religion. Today, you can see vestiges of these events both in the village and its immediate surroundings. The naturally defended trogolydyte caves, the numerous castles and fortresses, the fortified towns and churches, as well as the many chapels and abbeys of this period, all remarkabley well preserved. The flourishing industrial era also left traces in Les Eyzies with the remarkable collection of buildings which make up the La Forge ( Royal Foundry). Here too was a thriving kaolin industry, developing and manufacturing this vital component of Limoges chinaware. The end of the 19th century saw the arrival of the railway and indeed it was while laying the track for the Paris-Agen railway line that workmen discovered the remains of Cro-Magnon man. In keeping with the huge increase in leisure activities, tourism has now reached our village. Today it is the principal source of revenue and employment with a wide variety of cultural and sporting activities. There is an excellent infrastructure of camping sites, hotels, bed and breakfast accommodation, restaurants, and shops to satisfy the increasingly international and varied demands of our visitors. For more information about the city of Les Eyzies and attractions around town visit the Tourist Office of Les Eyzies or Les Eyzies Tourist .Info.